It is amazing how gorgeous these tomatoes look in a salad but, there is no point in making a long story about them because I already did (lol), so I will just go on with the recipe. Every time I think salad, tomatoes are 99% of the time included, I love them that much. They go great with any combination of ingredients and they will transform your dish from something boring, into an explosion of flavor and color. 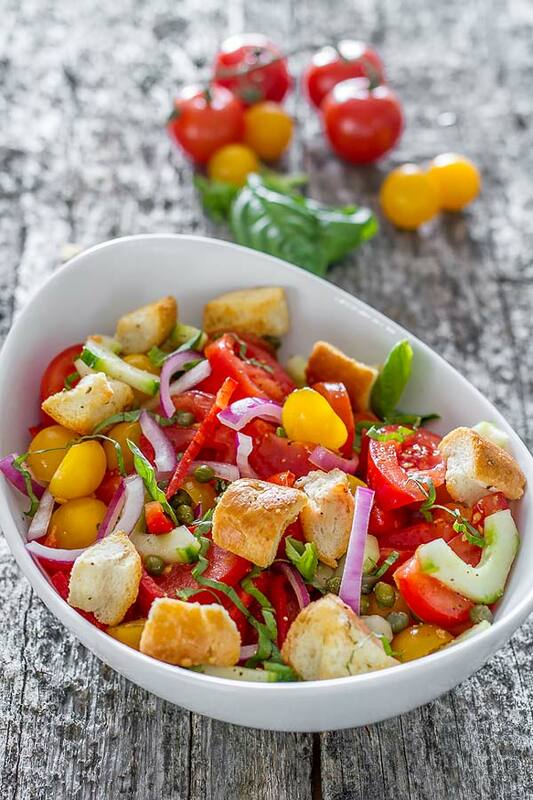 Take panzanella for example, a simple mix of bread and tomatoes, delicious in its simplicity, it is one of few recipes that keep reminding me of my childhood, soaking chunks of bread into the tomato salad leftover juice, the highlight moment of my meal. Every now and then, I like to go back and revisit some of my old time favorite recipes and try to come up with new ways of improving the original. Panzanella salad is my latest “improv” and besides the other delicious ingredients added to the original recipe, I also used toasted chunks of bread that instantly became a family favorite. The recipe is as easy as all the salads are, not even the bread is that difficult. I used a french baguette, sliced, cubed, whatever, you sprinkle a generous amount of olive oil on each piece along with some herbs of your choosing (mine was oregano), then bake them at 350° F / 175° C, for 20 to 30 minutes or until they get crunchy. Add them to your salad and the enjoy. If you need instructions in making a salad then get out of the kitchen and order some take out. If you still stubborn yourself into making a salad then start with the bread or if you want buy croutons instead. I recommend making your own though, they are delicious. Clean, chop, cut and slice all the ingredients. Mix everything together. Add olive oil, vinegar and bread croutons; toss lightly. Store in the fridge for 15-20 minutes and serve. How much bread is needed? Up to you, I think I probably used half of a French baguette.